Google's Zeitgeist report allows you to peep into which have been the fastest-rising queries globally. 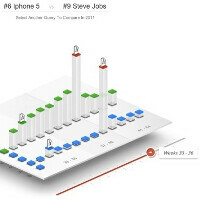 For 2011, three terms related to Apple have made the top ten list. The "iPhone 5" query, which was later replaced by "iPhone 4S", of course, was most prominent of the three at sixth place, preceded by Rebecca Black, Google+, Ryan Dunn, Casey Anthony and Battlefield 3. Then "Steve Jobs" was a fastest-rising query, occupying number nine in the ranking, and the top 10 list ends with the "iPad 2" term. This Zeitgeist report confirms once again that Apple has become an integral part of the modern day culture, and is likely to remain there for a while, even without Steve Jobs at the helm anymore. wow I am glad you cleared this up. Thought Zeitgeist was anti corporate,and non one union /system .....what are they doing so deep into the Google system?